Romantics will no doubt be interested to learn that the Hotel Due Torri is only a few steps away from the famous balcony of Romeo & Juliet. 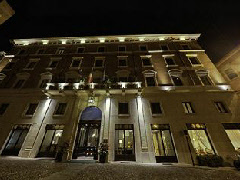 In fact, the 14th-century hotel - located in the Palazzo de l’Aquila - pre-dates the Shakespearian characters by some time. Awash with antiques, the hotel has 90 rooms and suites, many with delightful views of the square below. These include the Maria Callas suite (the great opera singer would often stay at the hotel); the Suite Saint Anastasia; and the Romeo and Juliet. In addition to a handful of long-dead European aristocrats, the hotel has played host to Giuseppe Garibaldi, Goethe and – perhaps most notably – Wolfgang Amadeus Mozart.